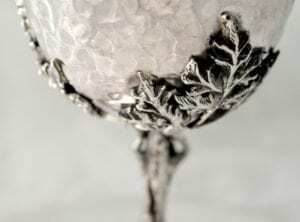 Sterling silver Kiddush cup and plate set with personalized engraving and nature-inspired design. Hand-carved branches twist around the stem of the cup as leaves and grape vines grow out of the stem, holding up the bowl of the Kiddush cup, which widens and creates an open-top Kiddush cup, complete with a gold-coated interior. The cup sits atop a classic silver Kiddush cup plate, with a three-dimensional Magen David (Star of David) sitting in the center of the plate. The set comes together with your choice of engraving that will shine on the Kiddush cup. Personalize the wording to create a unique piece which will be treasured forever.